The present work aims at studying the interactions between cholesterol-rich phosphatidylcholine-based lipid vesicles and trioctylmethylphosphonium acetate ([P8881][OAc]), a biomass dissolving ionic liquid (IL). 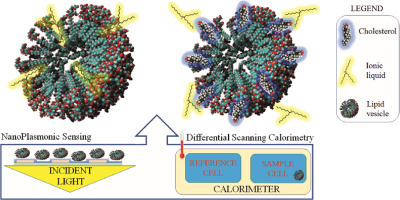 The effect of cholesterol was assayed by using differential scanning calorimetry (DSC) and nanoplasmonic sensing (NPS) measurement techniques. Cholesterol-enriched dipalmitoyl-phosphatidylcholine vesicles were exposed to different concentrations of the IL, and the derived membrane perturbation was monitored by DSC. The calorimetric data could suggest that the binding and infiltration of the IL is delayed in the vesicles containing cholesterol. To clarify our findings, NPS was applied to quantitatively follow the resistance of 1-palmitoyl-2-oleoyl-sn-glycero-3-phosphocholine incorporating 0, 10, and 50 mol% of cholesterol toward the IL exposure over time. The membrane perturbation induced by different concentration of IL was found to be a concentration dependent process on cholesterol-free lipid vesicles. Moreover, our results showed that lipid depletion in cholesterol-enriched lipid vesicles is inversely proportional to the increasing amount of cholesterol in the vesicles. These findings support that cholesterol-rich lipid bilayers are less susceptible toward membrane disrupting agents as compared to membranes that do not incorporate any sterols. This probably occurs because cholesterol tightens the phospholipid acyl chain packing of the plasma membranes, increasing their resistance and reducing their permeability.